“If you shout at us we will cry, we are so sensitive” Abu Mohanad Al Mahamid told me on the 20th September 2018. Al Mahamid is the leader of the still-functioning White Helmet center in Dara’a Al Balad to the south of Damascus in Syria. Al Mahamid had donned his white helmet for the camera before he spoke to us about the role of these White Helmets who had remained in Dara’a Al Balad, when other White Helmet members had boarded the buses for Idlib with Nusra Front or for Israel and Jordan as part of the special evacuation organised by the members of the US Coalition. The journey to this White Helmet center had been a circuitous one. I traveled with my translator and a Syrian journalist working independently on this trip. Since July 2018 a tenuous ceasefire had been negotiated between the armed groups and members of the Russian Reconciliation team. Conditions included the surrendering of heavy and medium weapons. (De-escalation zones had previously been established in mid 2017). Russia secured the right of admission to liberated areas for the Syrian Arab Army and the withdrawl of extremist groups from areas close to the Jordanian borders. The Al Nassib border crossing, for example, would come back under the management of the SAA. While some groups occupying areas in the countryside and city of Daraa accepted the Russian conditions, Dara’a Al Balad was one of the areas that chose to continue with a ‘policy of confrontation’. Russia had offered a separate deal to the rebranded Nusra Front faction, Hayat Tahrir Al Sham (HTS), occuping areas of Dara’a. According to the report in Enab Baladi, the former Emir of HTS, the infamous Abu Jaber, turned down the Russian proposal. Abu Jaber had originally been one of the founding commanders of the “moderate” extremist group, Ahrar Al Sham, responsible for a number of brutal ethnic cleansing massacres in Syria. The carnage in Al Zara in the suburbs of Homs was carried out by this group in May 2016, targeting a predominantly Alawite community. One of the more horrifying images to emerge from this bloodthirsty rampage was one depicting Ahrar Al Sham militants standing over the corpses of brutally murdered women. Despite these repugnant sectarian crimes against the Syrian people, the US administration refused to comply with Russian demands that Ahrar Al Sham be designated a “terrorist” group. In January 2017 Abu Jaber resigned from Ahrar Al Sham altogether and five major extremist groups merged into the rebranded HTS with Abu Jaber as their Emir. In October 2017, Abu Jaber was replaced as Emir by Mohammed Al-Joulani. During its formation, HTS had also released a statement “saying that six leading jihadi scholars have joined the newly formed group.” One of these was Sheikh Abdullah Mohammed Al Muhaysini, a Riyadh educated and financed zealot, one of the most extreme and bloodthirsty ideologues operating in Syria. The US administration designated Muhaysini a terrorist in 2016. The UK Intelligence propaganda construct, and multi-million-dollar US Coalition-financed White Helmet group has consistently demonstrated its ties to these terrorist and “moderate” extremist groups in Syria. White Helmet operatives have been filmed with Muhaysini in the countryside of Northern Hama/Idlib, welcoming terrorist factions evacuated from Daraya as part of the Syrian Government’s Amnesty and Reconciliation deal, in August 2016 . Muhaysini has often endorsed and supported the White Helmets, describing them as “no different to the Mujahadeen (armed groups)” in September 2016. In March 2017, while Emir of HTS, effectively Al Qaeda, Abu Jaber praised the White Helmets as the “hidden soldiers of the revolution”. The White Helmet billionaire funded PR industry and their supporters in corporate media have tried, unsuccessfully, to distance the White Helmets from their ties with HTS. This introduction will provide important background to the claims and statements made by the White Helmets and FSA commander, Adham Alkarad whom I also met in Dara’a Al Balad in September 2018 while inside the White Helmet headquarters. After discussions with the Syrian Arab Army and Russian Military Police officials we entered areas of the countryside of Daraa and Daraa City , accompanied by members of one of the armed groups that had accepted Russian/Syrian ceasefire conditions, Shabab Al Sunnah. We visited the Ramsa border with Jordan which is for vehicles only and was one of the main supply routes from Jordan to the assorted armed groups occupying Daraa City and the surrounding areas.As we hear so often during these trips, the members of Shabab Al Sunnah confirmed that Nusra Front had been the dominant force in the province. After the border with Jordan, we headed north-west to the Air Defence Base that had been the scene of the massacre of the SAA soldiers defending the base by members of the Al Bunyan Al Marsous military operations group that was made up of 17 armed factions including HTS, Ahrar Al Sham and various divisions of the “moderate” FSA. The motto of the group was “Death and No Humiliation”. On 20th June 2017, the base was overrun by extremist groups. The majority of the SAA soldiers were brutally murdered. To our knowledge four soliders were taken captive and the bodies and captives were brought back to an area very close to the White Helmet center in Dara’a Al Balad. Image taken from Twitter showing Air Defence Base under attack and on point of capture June 2017. A White Helmet operative was videoed clambering over the broken and bloody bodies of the soldiers while one of the armed group members held a severed head aloft in triumph. Another video was also released showing the militants laughing and manhandling the bodies piled on top of one another in the back of the truck. I will cover this incident in more detail later in the article and demonstrate that the White Helmets and HTS/FSA were responsible for a hideous war crime, one of many ignored by the colonial media cartel in the West. The Air Defence Base had then been taken over and occupied by HTS/Nusra Front, again according to the Shabab Al Sunnah fighters, before its liberation by the SAA in 2018. The road into the base was still strewn with the remnants of destroyed tanks and armoured vehicles, the burned out remains of a rocket launcher pick-up truck was turning to ash behind a bank of earth. Inside the base we could see the familiar HTS graffitti and logos of the military groups on the walls of the huts and corrugated metal portakabins. It was a strange experience to walk around the base in the company of fighters who very possibly participated in the “moderate” offensive that had claimed the lives of the SAA defenders whose bodes had then been so abused and dehumanized. After visiting the Air Defence Base, we drove through the Al Manshia district of Dara’a Al Balad. In 2014 Al Manshia was still under control of the SAA and it came under concerted attack from the “moderate” FSA forces. These militants, power multiplied by the US Coalition, pounded Al Manshia with tank and mortar fire, they dug tunnels under SAA positions, packed them with explosives and detonated them. For the FSA the taking over of Al Manshia was strategically important as it secured control over all of Dara’a Al Balad (Old City) and opened the road to Dara’a al-Mahatta (New City) for the armed groups. It was also a battle to prevent SAA control over the Nassib border crossing with Jordan and to secure the crossing for the supply of equipment for the armed groups. Battles in Al Manshia raged back and forth and in February 2017, the FSA combined forces with Ahrar Al Sham and HTS (Al Qaeda) to conduct another major offensive against the entrenched SAA. One month later the SAA pushed back against the Nusra Front-led forces and retook part of Al Manshia. Final SAA liberation of the Manshia district took place in July 2018. In the early days of the Syrian conflict, the reporting was heavily weighted in favour of the “rebels” and was being led by the likes of the BBC, Al Jazeera and CNN who lionised the armed groups while holding the Syrian government almost entirely responsible for the loss of life as the sectarian mob violence that they whitewashed threatened civilians and security forces alike and chaos reigned, particularly in Dara’a. I will not be going into depth in this article but recommended reading (or viewing) on the reality of what happened in Dara’a can be found here, here and here. “The Omari Mosque was the scene of backstage preparations, costume changes and rehearsals. The Libyan terrorists, fresh from the battlefield of the US-NATO regime change attack on Libya, were in Deraa well ahead of the March 2011 uprising violence. The cleric of the Omari Mosque was Sheikh Ahmad al Sayasneh . […] However, the visitors from Libya did not make themselves known to the cleric, as that would blow their cover. Instead, they worked with local men; a few key players who they worked to make their partners and confidants. The participation of local Muslim Brotherhood followers, who would assist the foreign Libyan mercenaries/terrorists, was an essential part of the CIA plan, which was well scripted and directed from Jordan.” ~ Steven Sahiounie, The Day Before Deraa:How the War Broke out in Syria. We pulled up behind the Al Omari Mosque which was the scene of the allegedly “peaceful” protests that rocked the centre of Dara’a and became the beacon of Western media sensationalism and “rebel”-biased fervour in the early days of the Syrian conflict. We followed the Shabab Al Sunnah fighters into the courtyard of the Mosque and we had time to wander among the archways and to film the damage that had been done to the historic site. Walking around the Mosque was reminiscent of entering the Omayyed Mosque in the Old City of Aleppo immediately after its liberation from the extremist gangs that had occupied it for almost five years and converted it into a sniper’s nest and military centre. There was still a sense of brooding tension and I felt the same again inside the Al Omari Mosque. A young boy who is seen in the video (and photo above) did stop to tell us that life was better now that the ceasefire had come into effect, he was glad to be back in school and to see an end to the violence that had wracked his neighbourhood for so many years. The Shabab al Sunnah fighters had picked up on the fact we wanted to speak to the White Helmets so they obliged by bringing us to the only functioning White Helmet center remaining in Daraa and Quneitra according to the members we spoke to in the center. It was explained to them that I was an independent British journalist by my translator. The Center was a small building in the grounds of what looked like a school complex. The White Helmet center is the pin showing how close the center is to the Al Omari Mosque. Satellite image showing the buildings that made up the White Helmet center in Dara’a Al Balad. When I asked what the larger building was, I was told it had previously been a school that had been taken over by Nusra Front/HTS, so again it appears that the White Helmets were operating in close proximity to the terrorist group. This close collaboration was also evident in East Aleppoand in Eastern Ghouta based upon testimony from civilians who had lived under the occupation of the extremist groups partnered by the White Helmets. When I visited the Christian town of Al Skeilbiyyeh in September, I was also shown a White Helmet and Nusra Front center in Al Madiq Citadel that was the tallest building in an area fully occupied by a combinaton of Ahrar Al Sham, Nusra Front (HTS) and Jaish Al Islam according to the National Defence Forces who were defending their town against attacks by these groups. The NDF also told me that the majority of these terrorist groups and the White Helmets had arrived together following their evacuation from Eastern Ghouta in March/April 2018. Throughout the various SAA allied military campaigns to liberate areas of Syrian territory, it is customary for the White Helmets to relocate with their Nusra Front counterparts during the reconcilation and evacuation process. Therefore, it was a rare opportunity to speak to White Helmets who had chosen to remain in an area still under control of the armed groups but under the partial supervision of the Syrian government and the Russian Reconciliation teams. During his initial display of neutrality Al Mahamid was clearly on a drive to persuade me of the White Helmet good reputation. When questioned about the White Helmet involvement in executions carried out by HTS and associated groups in Dara’a, Al Mahamid was quick to echo the White Helmet party line which presents these White Helmets who do collaborate in crimes committed against Syrian civilians and SAA prisoners, as being “bad apples“, who are “sacked” for “misconduct” – rather than criminal thugs who collaborate in torture, execution and the punishmentof those who do not comply with their sectarian ideology or who have remained loyal to Syria’s government and army. An interesting point is made here by Al Mahamid. If a White Helmet center is run by a Nusra Front member then all his colleagues will also be Nusra Front. This vindicates claims made by myself and other independent analysts that any area occupied by Nusra Front will be dominated and controlled by Nusra Front. Nusra Front is a brutal, ideologically supremacist organisation, so it would make perfect sense that if a White Helmet group is led by a prominent member of Nusra Front, the members are likely to adhere to the same ideology and to follow the same practices of extreme sectarian hatred and violence. Case in question is the leadership of the White Helmets in East Aleppo. Abdulaziz Maghrabi was not only an armed member of Nusra Front but had also been an armed member of the Turkish-backed Al Tawhid brigade which invaded East Aleppo in 2012. Maghrabi also demonstrated allegiance to Abu Amara, the Nusra Front protection corps in East Aleppo. Maghrabi was photographed, on a number of occasions, working with both Nusra Front fighters and Abu Amara groups. During my time in the south, I had also visited Quneitra and followed in the tracks of the armed groups and White Helmets as they were evacuated from Syria into the Israeli-occupied Syrian territory of the Golan heights and, from there, were transported to Jordan. Of the estimated 800 who escaped Syria by this Israel-facilitated route, allegedly only 442 made it to Jordan for resettlement in the designated countries which included Canada, UK, France and Germany. I visited one White Helmet center in Jabata Al Khashab, Quneitra which was again contained within a complex controlled by Nusra Front but also incorporating the centers of the FSA and Al-Furqan brigade. I was shown to a small room which was reportedly used as a prison and torture cell by the armed groups. The room was actually part of the White Helmet building, which I was told, was known as Station 103. While at the border crossing with Israeli occupied Syrian territory we also saw the footings and remains of what had been a three storey hospital (sign reads “birth clinic”) that, I was told, had been dismantled by the armed groups before they exited Syria. Israeli food products and medicine packaging were strewn around the site. We were also told that terrorist fighters only, were treated at the hospital, no civilians. Terrorists who were seriously injured were taken into Israel for treatment before being returned to southern Syria. This was confirmation of previous reports of the collaboration between Israel and the various armed groups occupying southern Syria. Al Mahamid’s claim that 50% of those evacuated by Israel were extremist and terrorist group leaders was also confirmed by a number of civilians living close to the areas traversed by the “special” evacuees. As always, when asking for people to identify the different groups, I was given the familiar puzzled look before they told me “they are all the same, all terrorists”. In the centers I visited in the south, it was clear that Nusra Front and the assorted extremist groups were working together. According to eminent analyst and journalist, Sharmine Narwani, “Israel is so heavily vested in keeping Syria and its allies away from its borders, it has actively bolstered al-Qaeda and other extremists in Syria’s southern theater.”. “Despite its U.S. and UN designation as a terrorist organization, Nusra has been openly fighting alongside the “Southern Front,” a group of 54 opposition militias funded and commanded by a U.S.-led war room based in Amman, Jordan called the Military Operations Center (MOC). [..]Efforts to conceal the depth of cooperation between Nusra and the FSA go right to the top. Says one FSA commander in Daraa: “In many battles, al-Nusra takes part, but we don’t tell the (MOC) operations room about it.” ~ Are Al Qaeda Affiliates Fighting Alongside U.S Rebels in Syria’s South? White Helmet Number Two – Nidal Al Mahamid. Nidal introduced himself as the mechanic for the White Helmet vehicles. Parked in the bay behind him was a UK-registered fire engine. Contrary to reports in Western media that the White Helmets would be systematically targeted by the Syrian government and the SAA – Nidal seemed to have no problem working under the “semi-supervision” of the government. Nidal informed me that they had been paid by the Mayday Rescue organisation but had not received any payments since June when the reconciliation negotiations were ongoing. This must raise the question – if the UK Government is financially supporting a genuine humanitarian effort for the people of Syria why would funding suddenly cease when an area is returned to the control of the Syrian state yet the organisation chooses to remain to “serve” the same people? Mayday Rescue is the UK FCO (Foreign Commonwealth Office) sub-contractor which channels funding from the Conflict Stability and Security Fund (CSSF) to the White Helmets. The Netherlands government has recently suspended funding to the White Helmets and Mayday Rescue on the basis that neither were able to provide reassurances that the funding was not ending up in the hands of the armed extremist groups, including Al Qaeda. Mayday Rescue was founded in 2014 by James Le Mesurier, a former MI6/British Military operative who established the White Helmets in Turkey and Jordan in 2013, while working for the ARK Group. Nidal told us that the White Helmet workers in Dara’a Al Balad were receiving $ 150 per month with an additional $ 25 for food and essentials. There had been another center on the Dam road, according to Nidal, but this was now closed down since the reconciliation agreement with the Syrian Government. This salary is considerably higher than that of a SAA soldier who takes home around $ 50 per month. Many SAA soldiers are obliged to take another job such as taxi driving to be able to take care of their families and needs. The claim has always been that the White Helmets are volunteers rather than de facto paid up employees of foreign governments led by the U.K and U.S whose long-term policy is the overthrow of the Syrian government. Abu Mohanad Al Mahamid interjected at one point that Raed Saleh had “sold them out, traded them in“. Certainly there did not seem to be any great love for the main spokesperson for the White Helmets who appears to be comfortably ensconsed in Turkey and clearly is not concerned for the White Helmets in Dara’a Al Balad. How Impartial is Abu Mohanad Al Mahamid really? 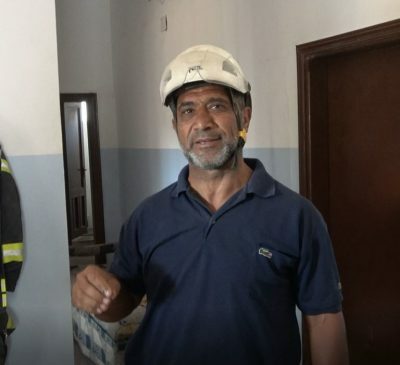 As I was leaving the White Helmet center in Dara’a Al Balad, Abu Mohanad came after me, he wanted to reassure me that he was not “sectarian” – “I married a Shia Muslim woman” he told me with a grin on his face. It was clearly impossible to verify this curious statement. However, the research carried out into Abu Mohanad and his “affiliations” demonstrated that his performance to camera had not been an entirely honest one. Abu Mohanad’s profile picture taken from his Facebook page. A video and photograph posted to the page in February 2018 show Abu Mohanad Al Mahamid holding up placards and joining a demonstration in solidarity with the armed factions in Eastern Ghouta as the SAA military campaign had begun, to liberate the area from the terrorist and extremist group occupation. In the video we see a prayer for military action by the “jihadists” and armed factions in Eastern Ghouta. One of the slogans being displayed, in the video, calls for military action to take Damascus and the coastal areas in support of the Jihadists in Eastern Ghouta. There is another slogan calling upon the sons of “Houran” (the armed groups in Daraa) to go to the aid of their Salafist counterparts in Eastern Ghouta. Abu Mohanad had emphasised his lack of political or military affiliation during his interview, yet this activity suggests otherwise. Houran is the plain that covers territory in Daraa, Sweida and extends into Jordan. A quick scan of the “friends” of Abu Mohanad on his Facebook page reveal a number of armed members or supporters of extremist groups such as Jaish Al Islam, responsible for the atrocities in Douma that include the thousands of kidnap victims held and tortured in the “Repentance” prisons. There is a video interview with Abu Mohanad after he has been injured in Daraa in May 2018. Screenshot from Halab Today interview with Abu Mohanad in May 2018. In a 2015 Al Jazeera video report we see Abu Mohanad being interviewed alongside members of the White Helmet teams in what we believe to be the Dam Road center in Dara’a Al Balad. During the video we see the White Helmet members training inside the center wearing T-shirts with the FSA logo on the back. The leader of the White Helmets at this point is Abdellah Assarhan. Assarhan was also known as Abu Yassin. Assarhan was reportedly killed when his car was targeted in March 2017 and hisfuneral was attended by an assortment of White Helmets and extremist armed group members. An early Facebook profile photo of Assarhan shows him wearing a T-shirt with the FSA logo. According to a Facebook tribute to Assarhan by someone who clearly knew him well, Assarhan was one of the early fomenters of the violence in Daraa – he called for the formation of the “revolutionary” armed factions at the beginning of the Syrian conflict, in the Dara’a camps. Here is the short video footage of that speech. Watch video here. As already mentioned the massacre of the SAA 5th Division in the Air Defence Base took place on the 20th June 2018 and was barely reported in western media circles. The loss of life among the SAA defenders of Syria and protectors of the Syrian people is deliberately marginalised or played down by the NATO-aligned media who do their utmost to dehumanise the courageous men and women who have taken up arms to defend their country against what is effectively an invasion of foreign terrorist groups financed and controlled by the US Coalition, the Gulf States, Turkey and Israel. Collage of screenshots from the video of the White Helmet abusing the corpses of SAA soldiers. A number of gruesome videos have emerged showing the aftermath of this massacre, none of which will be embedded in this article, out of respect for the families of the dead and mutilated SAA soldiers. In one video that was tweeted by journalist, Ali Kourani, we see a White Helmet member climbing over the corpses of the soldiers in the back of a pick-up truck. While he is picking through the bodies, an extremist militant pulls out the severed head of one of the soldiers and holds it up to camera as a victory trophy. The headless body is then kicked by the terrorist fighter as it lies suspended on the tailgate of the truck. Another video shows the truck seeming to arrive in Dara’a City. The bloodied and broken bodies of the SAA soldiers are jostled and mocked by bystanders and armed militants. Two men lift the head of one soldier to camera and laugh, the soldier’s face is covered in fresh blood. That video has been removed from most sites including YouTube. The link to my tweet is here but the footage is extremely distressing. Photos from the Facebook page of one of the armed groups – showing the four SAA soldiers captured during the massacre at the Air Defence Base. In a video posted by Al Bunyan Al Marsous (BM) operations room, they take responsibility for the massacre, celebrating the bloodbath to camera. Four SAA soldiers were taken captive that day. 1. Khaled Khleif alFares from the northern countryside of Hama, Makta’a al-Hajar, Fifth brigade. 2. Yousef Ahmad al-Sajer from al-Hasakeh, Raas al-Ayn, Fifth brigade. 3. Essa Ya’koub Ahmad from the countryside of Damascus, al-Ziabiyyeh, Fifth Brigade. 4. Muhannad Khaleifeh Shehadeh from the northern countryside of Hama, Makta’a al-Hajar, Fifth brigade. In the photos shown above we can see the BM logo in the top left hand corner of the photographs. According to the video footage I have found, these four SAA soldiers were brought back to Dara’a City close to the White Helmet center that I visited. The truck carrying the dead bodies of the martyred SAA soldiers of the Fifth Brigade also returned to the same area. BM released another video showing three of the captives speaking to camera. The fourth captive, Muhannad Khaleifeh Shehadeh from Hama was brought to what looked like a “medical center” where he was questioned aggressively by the armed militants standing around his bed. At the end of the video link, one of the armed extremists tells the “medical” staff to “fix” the soldier, to keep him alive for interrogation. These soldiers were eventually released as part of the reconciliation deals, in July 2018. Now lets go back to what Abu Mohanad Al Mahamid said to me while in the White Helmet center. We have made the connection between HTS and associated armed groups and the White Helmets. We have determined that the White Helmet center was once more in the grounds of a Nusra Front- dominated complex, as were all the White Helmet centers that I visited in the south. We have ascertained the high probability that the bodies of the SAA soldiers were brought back to the vicinity of the White Helmet centers in Dara’a City. We have see that a White Helmet operative was picking through the mutilated corpses of the freshly killed SAA soldiers and we heard that he was “sacked” for participating in what was clearly a war crime. The British Government has openly said that the White Helmets provide an “invaluable reporting and advocacy role”. Human Rights Watch and Amnesty International (both severely compromised NGOs who align themselves with U.S and U.K State imperialist policies) have admitted (in the same document) that the White Helmets “are their most routinely reliable source for reporting”. The British government document goes on to say “(White Helmets) have provided essential corroboration that (Russian) strikes were not targeting Da’esh but moderate opposition entities. This has provided confidence to statements made by UK and other international leaders in condemnation of Russian actions” (emphasis added). Effectively, asking the White Helmets to provide evidence of their own organisation’s participation in war crimes and collaboration in the atrocities carried out by the “moderate” entities is a hiding to nothing. They are literally paid not to do so as it would jeapordise their role as chief “evidence” provider to corroborate British foreign policy in Syria – regime change. The White Helmets have been given immunity by the governments that are bankrolling their propaganda construct and they know this. Despite the White Helmet history of falsification of evidence , proven by the OPCW interim reporton the alleged Douma chemical attacks that precipitated the FUKUS unlawful aggression against Syria – the White Helmets will not be held to account for enabling a criminal violation of international law by their controlling cartel of rogue nations. The corporate media has circled its wagons around the White Helmet organisation in an effort to prevent the wholesale discrediting of the group as nothing more than a terrorist auxiliary, trained in Turkey and Jordan, sustained with foreign money and upholding the violent, sectarian principles of the armed groups they associate and work with. While we were talking to the White Helmets in Dara’a Al Balad, a van pulled up with blacked out windows. A man came out, dressed in black and wearing sunglasses. He came straight up to me to find out what we were doing at the center. Once he learned I was British, he visibly relaxed and was less aggressive in his tone. He introduced himself as Akram AlKarad (also known as Abu Qusay). Alkarad was a short man, of stocky build and spoke almost perfect english with an American accent. As we were about to leave, we didnt have much time with AlKarad. He pulled me to one side and told me that armed groups under his control had not accepted reconciliation. I asked AlKarad why he wanted to continue with violence after all the death and destruction that Syrians had endured for 7 years. At this point the mood had become tense and we decided to leave the White Helmet center and head back to the outskirts of Daraa. When we returned to the SAA headquarters, one of the Generals told me that AlKarad had been responsible for the design and manufacture of the 500kg Omar rocket. The General took his shirt off to show me the multiple shrapnel scars that covered his torso from an attack by Alkarad’s brigade on the SAA Military HQ and surrounding civilian areas. Taken from the Facebook page of Alkarad’s brigade – the logo is in the top left hand corner – The Engineering and Missile Battalion. These so called “moderates” described in western media as “rebels” had an arsenal of weaponry that defies the image of “grass-roots revolutionaries” so pervasive in the West. I have compiled a series of videos produced by AlKarad and his Engineering and Missile battalion (EM) which demonstrates the fire-power that these “moderates” were able to produce and obtain. AlKarad was the leader of the EM battalion which became later the EM regiment which is part of “18 March” Brigade of the FSA. It is also clear from the list of members of the BM operations room that Alkarad’s EM belonged to the group. Alkarad himself has posted statements from BM to his FB page, here . In May 2016 AlKarad issued a statement on his Facebook page giving civilians 3 days to evacuate areas in Daraa under the control of the SAA, before AlKarad would launch an offensive with the “Storm” surface to surface rockets. The statement ends with the chilling justification for the potential deaths of civilians in those areas “After the warning period has expired, we will be innocent in front of God”. The “Storm” rocket is a hugely destructive missile and there would be a very high likelihood of a civilian massacre yet this is not explored by the corporate media when they report on the “rebel” campaigns of devastation and terror. Photos on the EM regiment Facebook page show the corpses of SAA soldiers early June 2017 before the attack on the Air Defence Base on the 20th June. In September 2016, AlKarad published a speech on his YouTube channel calling for intervention by Pakistan, Indonesia and Saudi Arabia in solidarity with “Sunni muslims”, he also calls upon other nations to stand by the Syrian “revolution”. AlKarad reads his speech in English in a clear attempt to influence his western supporters. An excerpt from AlKarad’s speech (English with Arabic subtitles). Watch video here. In March 2017, AlKarad published a statement to his Facebook page, from BM, threatening the SAA soldiers and positions in Al Manshia, only two months before the attack on the Air Defence Base. The fact that AlKarad turned up at the White Helmet center in Dara’a Al Balad so soon after we started talking to the members is indicative of his influence in the area and over the British Government “propaganda construct”. The fact that AlKarad told me he would contact CNN and BBC directly is an indication of the direct lines of contact between U.S and U.K state media outlets and the leaders of the armed groups in Syria. We have published videos showing the White Helmets sporting the FSA logo, during a training exercise. The fact that one of their early group leaders was an armed member of the FSA and a founder of the military factions in Dara’a, again suggests that the White Helmets in Dara’a had very clear partiality towards the “moderate” extremist factions who promote sectarian division to push for international intervention in Syria. AlKarad profile picture on his Facebook page. AlKarad’s EM regiment was a part of the Al Bunyan Al Marsous attack on the Air Defence Base. The SAA bodies and captives were brought back to Dara’a City. A White Helmet was seen particpating in and celebrating the dismemberment of those bodies. Eva Bartlett was told that civilians in Dara’a had witnessed the White Helmet operatives cutting up the bodies of SAA soldiers and putting them in plastic bags before throwing them in the rubbish dump. We see a rubbish dump in the video of the White Helmet, tweeted by Ali Kourani. A White Helmet operative has told me that if a White Helmet faction is led by Nusra Front (many are according to Al Mahamid), then it follows that the whole group will be Nusra Front. The White Helmets in Dara’a were originally led by a member of the FSA – Abdellah Assarhan. Following Al Mahamid’s logic then all members of the Dara’a White Helmets will be FSA and involved in furthering the sectarian aims of the FSA in Dara’a. It is simply not good enough to “sack” a member of the White Helmets who has participated in excecutions, torture, brutality and violence. The prima facie evidence is now strong enough that there should be a demand for a public enquiry into this organisation. The White Helmets provide the majority of “evidence” used by the British government and its allies in the U.S Coaltion, to shape their foreign policy in Syria and to support their systematic violation of international law and unlawful aggression against Syria and her allies. The White Helmets and the governments that finance them, and effectively provide them with immunity from accountability, should all be brought to justice for the crimes they have committed against the sovereign nation of Syria.